In 1995 at the age of 16 Mike Johnson sustained a spinal cord injury during a high school football practice. 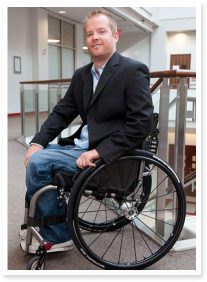 This injury left Mike with quadriplegia. Paralysis not only affects your arms and legs. Your bowel and bladder function is also disrupted. And so began Mike’s early introduction to among other things the many methods and products used to maintain a healthy bowel and bladder. When shopping for products or services it is a reasonable expectation that the store staff would have a certain level of knowledge for the products or services they sell. Right? Mike really had a difficult time finding answers to his questions regarding urology supplies. He happened to come across a product by chance that better addressed his needs. It was then that he thought to himself that we – the users of niche medical supplies – deserve better! Enter SCI Supply Inc.! The business was designed in an effort to enhance user’s knowledge about the many product options available to them. Equally important was improving the shopping experience itself. The online model fits with this user population perfectly. We can reach users in the far corners of this great country and eliminate the need for you to come to us. The website has features built in that greatly improve the user experience. The product catalogue is divided into sub-categories. The checkout process is quick and clean. It is even faster for repeat customers! Mike understands first-hand how vital these products are to your everyday life and this enabled him to design the business with the customer as the focal point! 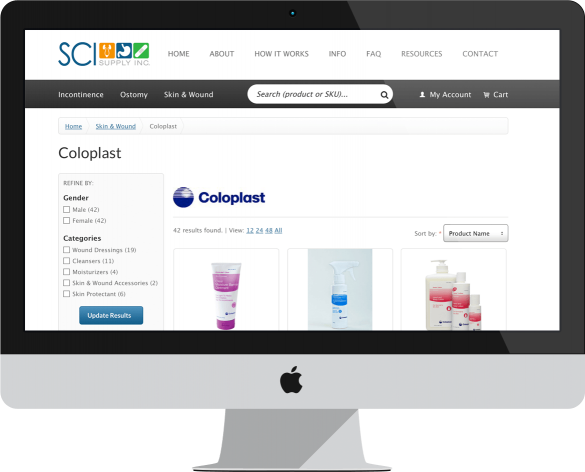 SCI Supply Inc. has distribution centres set up in both Ontario and British Columbia. This helps to ensure that no matter where you live in Canada your supplies are not far from you. "Hats off – already received the shipping notification, delivery expected tomorrow.